Fox News’ Jeanine Pirro has been booted from her Saturday time slot, at least for now, after making Islamophobic comments about Representative Ilhan Omar last week. Guess who isn’t happy about it? 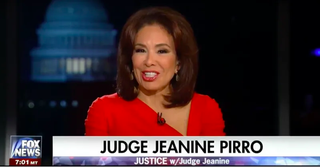 According to CNN, there’s no indication that Pirro has been fired from the network, though it’s unclear whether her Saturday show, Justice with Judge Jeanine, will return as usual next week. Trump, naturally, is furious that one of his most stalwart mouthpieces has been silenced, firing off more than 30 tweets over the course of the day. Some of those tweets were dedicated to “fighting for” Pirro and the perennially vile Tucker Carlson; others were...this. Uh, happy St. Patrick’s Day, indeed.